A sideswipe accident may not have the heavy impact and high fatality rates common in head-on collisions, but that does not mean these crashes are harmless. Sideswipes can cause severe injuries and costly damage to vehicles, even if they are usually considered “minor” accidents. Sideswipe collisions go by many names, including lane departure accidents, glancing blow crashes, or blind spot accidents. In a sideswipe collision, contact is made on the sides of two vehicles traveling next to each other. Although this “swiping” between cars may seem like a near-miss, an accident has still occurred and injured victims are owed compensation. Parallel vehicle collisions. Sideswipes may occur when two vehicles are traveling in the same direction, such as on a highway. If drivers regain control of their vehicles and get back into their lanes, they may only have cosmetic damage to their vehicles. Opposite direction crashes. A vehicle may swipe another that is traveling in the opposite direction, such as on a two-lane city street. These sideswipes are less common since opposite directions accidents are more likely to involve the front end or corner of the vehicle. Secondary effects. 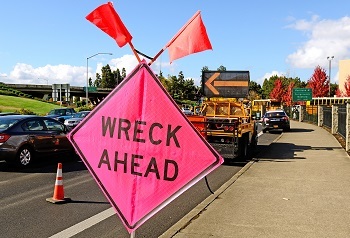 If the driver who is struck loses control of the vehicle, the car may swerve into a ditch, collide with a tree or stationary object on the side of the road, or veer into another lane and meet another vehicle head-on. Under Tennessee law, drivers have a duty to stay in their own lane of travel, and it is illegal for a driver to change lanes unless he or she has verified that it is safe to do so. If a driver was not obeying the law, he or she could be considered negligent and may be held liable for damages in an injury case. Improper lane change. Many actions could be considered a failure to execute a lane change, including traveling at an unsafe speed for passing, failure to check mirrors and blind spots, and misjudging the available space between cars before moving into another lane. Emergency maneuvers. Drivers who are trying to avoid a crash with another vehicle or an object in the road may swerve into the adjacent lane, sideswiping the vehicle next to them. Merging. Sideswipe collisions often happen on highway on-ramps, interchanges, and other places where two lanes merge. Drivers who are traveling too fast or are unwilling to “let in” a driver could suffer a sideswipe collision at the end of the merging lane. Distracted driving. Drivers may be more focused on their cell phones, GPS devices, or passengers than they are on the road, causing them to forget to check blind spots before moving over. Impaired driving. Drunk or drugged drivers are often reported because they are weaving in and out of traffic or cannot maintain a lane for more than a few seconds. Drowsy driving. A fatigued driver may accidentally drift into another lane or even strike several cars if he falls asleep at the wheel. Speeding. Cars become more difficult to control at high speeds, especially if there is a strong crosswind. A person driving too fast for weather conditions may be blown sideways into the car in the next lane. Defective auto parts. If a tire blowout or engine failure causes a driver to lose control of a vehicle, victims may be able to file an injury claim against the manufacturer of the car or auto part. Vehicles are designed to provide the most protection after a strike to the back or front of the vehicle, making sideswipe collisions particularly hazardous to passengers. Sides of vehicles may not be equipped with airbags or strong steel pillars, and the door or side panel may be pushed into the interior of the car. Common injuries in sideswipe collisions include head, neck, and shoulder injuries, as well as broken bones for those traveling in the back seat. If you or someone you love was seriously injured in a sideswipe accident, the attorneys at GriffithLaw provide car accident injury consultations at no cost to the victim. In addition, our legal fees are paid with a portion of the settlement we secure for you, so you will not owe our firm anything until your case is resolved. To learn more, simply fill out the short contact form on this page or request a free copy of our book, The 10 Worst Mistakes You Can Make With Your Tennessee Injury Case.